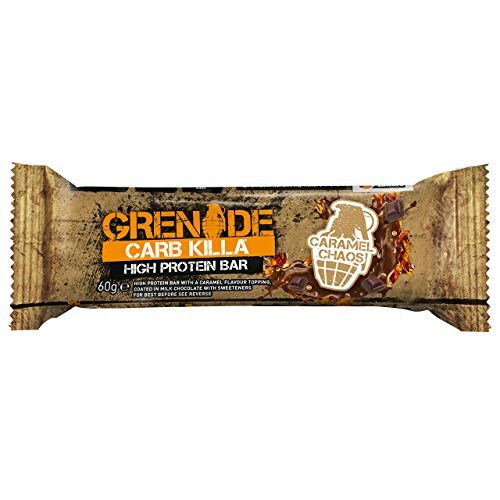 Carb Killa® is a triple-layered deliciously crunchy low sugar high protein bar.Made using a specially selected baking process for exceptional taste resulting in a softer, crunchier texture. Carb Killa® is high in complete proteins, low in impact carbs and loaded with tons of fibre. Carb Killa® is available in a range of flavours, including Caramel Chaos, Cookies & Cream, Fudge Brownie, White Chocolate Cookie, Dark Chocolate Mint, Chocolate Crunch, White Chocolate Mocha, Banana Armour, Peanut Nutter, Jaffa Quake and Chocolate Chip Cookie Dough each made up from delicious triple layers, all coated in chocolate. With low sugar and low calories, this bar really is the perfect high-protein snack. Protein Blend (Calcium Caseinate (Milk), Milk Protein Isolate, Whey Protein Isolate (Milk)), Milk Chocolate with Sweetener (18%) (Sweetener: Maltitol; Cocoa Butter, Whole Milk Powder, Cocoa Mass, Emulsifier: Soy Lecithin; Flavourings), Bulking Agent: Polydextrose; Hydrolysed Beef Gelatine, Humectant: Glycerol; SoyProtein, Cocoa Butter, Soy Oil, Palm Fat, Sweeteners: Xylitol, Sucralose; Skimmed Milk Powder, Low Fat Cocoa, Flavourings, Tapioca Starch, Salt, Emulsifier: Soy Lecithin.